Centenario from the house of Lamborghini is no new name and doesn’t need any special description. 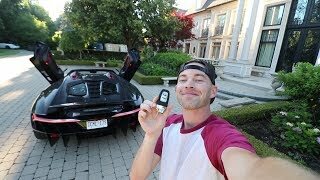 Lamborghini Centenario 2017 came with its 20 units that in no time got sold. The limited production model is created to celebrate the 100th birthday anniversary of Ferruccio, the company’s founder. 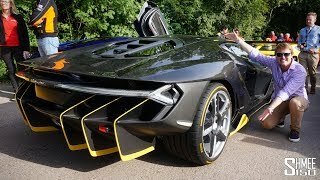 Let us have a look at the review of Lamborghini Centenario 2017 to know in detail about it. The interior of Lamborghini Centenario 2017 will take your hearts and minds to an entirely new world. It has Alcantara and Carbon fiber covering the arena with yellow stitching contrasting the later. The multifunction flat bottom steering wheel hides the fully digital instrument cluster. The later has two vertical gauges displaying all vital information. The center console comes with a 10.1 inch touchscreen mounted over seven control switches. The infotainment system includes internet browsing, sending e-mail and has Apple CarPlay with it. There are also cameras loaded inside so as to keep a track upon the experience that you are having while driving and in case of any emergency the instance can be well tracked. 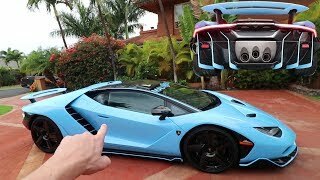 Thus rounding up the interior details of Lamborghini Centenario 2017 I would call it an extreme machine loaded with tech and luxury. The exterior of Lamborghini Centenario 2017 is way too aggressive with its looks that the automotive followers expected to have it after its announcement. Starting with the front fascia we have the elongated headlights flanking the raised nose. The massive front splitter and the vents give the model an aggressive touch. Looking at the sides we have the yellow side skirts adding aerodynamics and race-spec fins with massive air-intakes that adorn the sharp body lines. At the rear end we have a beefy deck lid and a barbaric rear diffuser that together create an entirely new saga for the model. The triple faced exhaust outlet finds its place in the middle of the diffuser and gets further complimented by the arrow-shaped taillights, depicting the model’s instincts. Thus rounding up the exterior details of Lamborghini Centenario 2017 I would call it highly aggressive and lime-light creator. Beneath the hood of Lamborghini Centenario 2017 sits a naturally aspirated V12 engine generating total output of 770 hp. To be mentioned that the engine is by far the most powerful engine coming from the house of the company. 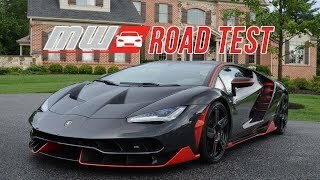 With this the top speed of Lamborghini Centenario 2017 touches the mark of 217 mph while the 0-62 mph sprint can be knocked in just 2.8 seconds.